What is it? – Sewing is all about construction. At its most elemental level whether your preference is fashion, heirloom, quilting, applique, home decor, or any combination, it is all the same. It’s putting fabric together in some arrangement that results in our predetermined creative vision. But before we can apply even the very first stitch we have to make sure our fabric is cut, folded and pressed to very specific dimensions. The fabric must be manipulated into the shapes that will result in the conclusion of that vision. Sharp scissors and a rotary cutter will make the shapes. But what about the creases or folds? What’s the best way to do that? Simple . 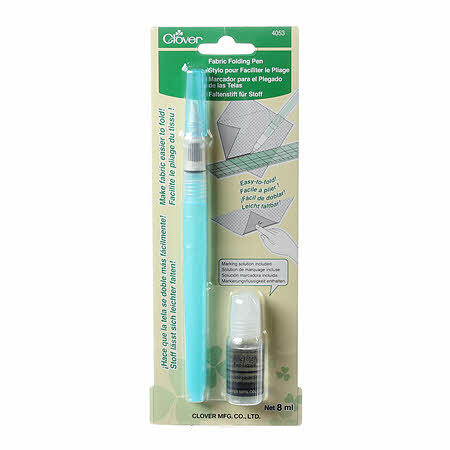 . . Clover’s Fabric Folding Pen. Think of a felt tip pen that is filled with what amounts to be a very unique fabric softener. Just remove the cap and with the felt tip trace either a straight or curved wet bead line on your fabric. The fluid from the pen causes the fabric fibers to relax at the point of application. Now you can fold along that specific line with ease and either finger press or iron to form a sharp, lasting edge. The pieces of your project can now be assembled easily and precisely and they will look great! What does it do? – The applications are endless and make fabric manipulation quick, easy and precise. English Paper Piecing can now be done without all of the stitches. Wow, what a time saver. Let’s you form all of your shapes quickly and easily and get on to the fun part of creating your finished product. The Fabric Folding Pen is a natural for appliqué or reverse appliqué. You can either trace or freehand any line that forms your design. These “relaxed” fibers will allow you to easily manipulate your fabric around that line. Doing patch pockets? Same principle. Trace the shape you want, fold along the line, press and then stitch in place. Easy peezie. Ever go to a sewing class and have to wait forever to use the iron? No more. Take your Fabric Folding Pen and you’ll be ahead of the rest of the class all night. We’ve all bought a piece of fabric that had an unwanted crease across it or perhaps we accidentally formed one while ironing. What’s the easiest way to get rid of it? Trace over the unwanted seam with the Fabric Folding Pen, iron and it’s gone. Think of it as reverse ironing.